Erik Fuhrer is interested in literary boundary crossings, manifested most recently in representations of the nonhuman and transgressions between human and nonhuman subjects in modernist literature. He is inspired by hybrid forms of literary expression that elide genre boundaries as well as by quiet, lyric poetry that often achieves the same transgressions more subtly. He is currently also a PhD student in English at Notre Dame where he is a presidential fellow. His work has previously appeared in The Long Island Quarterly, First Literary Review East, The Fib Review, The Shotglass Journal, and the Oxonian Review, where he was a finalist for their Third Annual Poetry Competition. 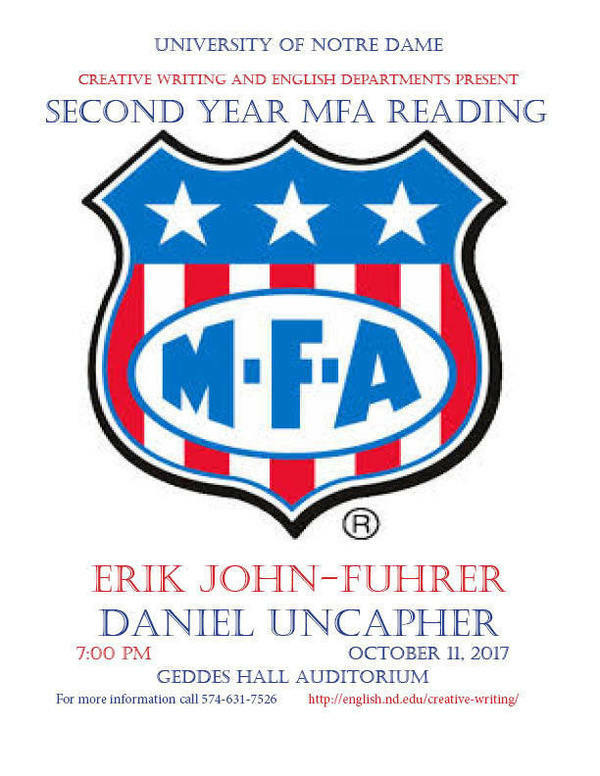 Daniel Uncapher studied philosophy and classics at the Universities of Edinburgh and Mississippi, where his creative non-fiction and poetry won first and third place in the 2013 Southern Literary Festival. He operates a private letterpress in Water Valley, Mississippi called Ridge & Furrow, collects incunabula and mid-century jacketed hardcovers, and used to be a hip-hop videographer. His most recent interests include the work of the Water Valley writer Hubert Creekmore and the unique literary legacy of Gogol, Chekhov, Kafka and Borges. His short fiction has appeared in Neon Literary Magazine and his creative non-fiction about Mississippi in The Baltimore Review.